The work of Loyola University New Orleans’ Bateman Team and the Office of Marketing and Communications was recognized by professional peers during the Public Relations Society of America’s 2010 New Orleans Chapter Awards on Nov. 9. 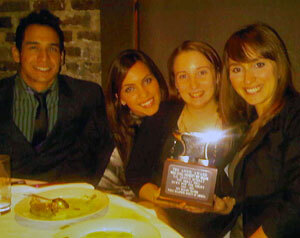 The 2010 Loyola Bateman Team received a Silver Anvil award for its campaign “Down for the Count,” which targeted traditionally undercounted populations in order to increase their participation in the census. The team entered their campaign in "The Great Idea” category. The team’s community and media awareness campaign relied on partnerships that targeted New Orleans’ Vietnamese and Hispanic communities and college students. Team members spoke to students in English as a Second Language classes; addressed parents during family literacy night at a majority-Latino charter school; hosted a face painting booth and distributed census information at Mary Queen of Vietnam Church’s New Year Tet Festival; and reached out to area universities’ government associations, Greek organizations and service providers. Jodi Forte of Carriere, Miss. ; Kate Gremillion of Baton Rouge, La. ; Christine Minero of Houston, Texas; Dominic Moncada of El Paso, Texas; and Marimar Velez of Miami, Fla. made up the winning team. "Of course, I'm proud that our Bateman teams rank nationally with other student teams, but I love when they win awards in a competition with experienced practitioners. It demonstrates that what we are teaching in the classroom is right on target," said Bateman adviser Cathy Rogers, Ph.D., head of the public relations sequence in the School of Mass Communication. Loyola’s Office of Public Affairs won an Award of Excellence for its Experts Guide. The guide was designed to help journalists find the right sources for their stories through Loyola’s faculty and staff expertise, and to expose other universities to our esteemed faculty and staff. It was created in an exciting visual format with tabbed sections and spiral binding for easy use. The booklet also provides reporters a quick narrative of who we are at Loyola University New Orleans and what sets us apart from other schools. The ultimate purpose of the guide was to increase news placements for the university. It was mailed to more than 200 national media representatives and to U.S. New & World Report peer universities. Since its mailing in May, Loyola faculty and staff have been placed in more than 2,000 news articles and segments regarding the oil spill alone. The Office of Marketing and Communications won an Award of Merit for its Service Learning Booklet, which highlights selected partnerships that engage first-year students in service learning opportunities. Loyola partners with more than 35 local community agencies—ranging from Bayou Rebirth to Casa de Oportunidades and teachNOLA—which provide students with real-life learning experiences through an academic course. The booklet’s purpose was to increase awareness of Loyola’s advancement and expertise in service learning to peer universities, for the purpose of increasing our peer perception in U.S. News & World Report rankings. They were mailed in January 2010 to ranking institutions, and in August 2010 U.S. News & World Report listed Loyola University New Orleans under “schools recognized for outstanding programs that enrich student success” in the service-learning category. Loyola was the only Jesuit institution listed in this category. For more information on the PRSA awards, contact the Office of Public Affairs at 504-861-5888 or publaff@loyno.edu.